Kitt's World: Roo Hops to another challenge! 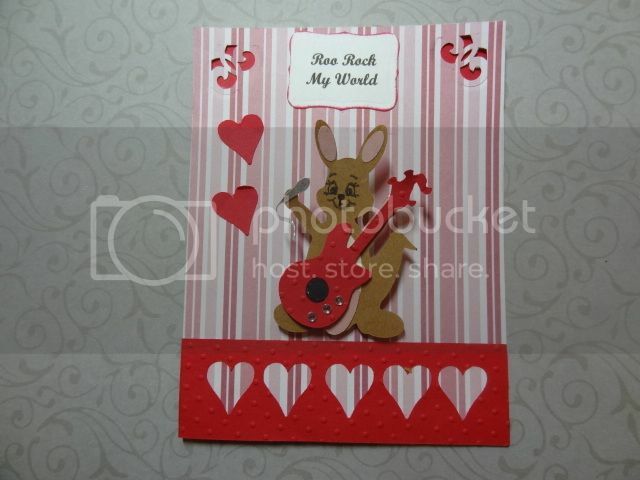 Roo hops to another challenge over at the Pink Elephant for the Pink and red challenge http://thepinkelephantchallenge.blogspot.com/ and Crafty Cards Challenge at CardzTV for the critter valentine challenge. I love the way Roo came about and being able to make my own action spring gizmo. LOL I created Roo in MTC. His face is a Peachy Keen PK754 Critter stamp set. I used the Everyday Paper Dolls cartridge for the guitar and the microphone. I also made the heart boarder in MTC. The sentiment label was edged in Memento Angel Pink ink and is from the Spellbinders Label 4 nestibilites die set. As always comments are appreciated. Thanks for stopping by.